I love pomegranates. The colour, the taste and unexpected tart pop of the seeds. They are still in season in Melbourne and I'm enjoying scattering them over anything and everything including three(!) of my Tuesday eats. 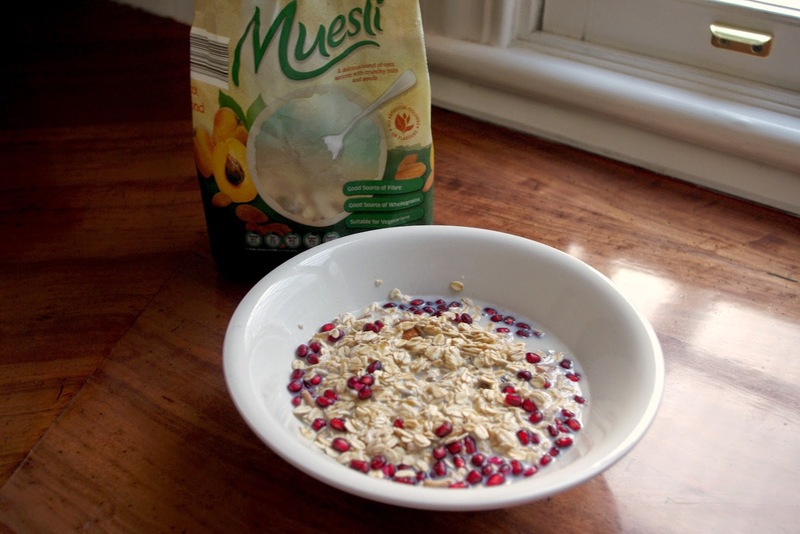 The usual muesli. Quick and easy. It's from Aldi and much cheaper than the same muesli at Woolworths. The sugar level is quite good for a muesli with dried fruit. It's hard to beat a toasted cheese sandwich - here I've added shredded chicken, avocado, cheese, sun dried tomato and roasted bell peppers and toasted in multi-grain bread. I buy the Wholemeal Country Grain loaf from Baker's delight as it is one of the few I've found that is both wholemeal and wholegrain. You might be surprised how many commercial multi-grain breads use white flour. Dinner: Roasted cauliflower, chickpea and pomegranate quinoa. A side of purple kale chips. I had a big head of cauliflower I needed to use and I found this recipe for Roasted Cauliflower And Chickpea Quinoa with Jalapeno-Lime Dressing. It is delicious and I highly recommend it as a tasty and healthy meal. It is also quite filling. I only changed the recipe by adding the pomegranate and baby spinach. The dressing was great, I just omitted the mint. I'm glad I made enough for lunch tomorrow. This was left over from the night before. It is a simple apple crumble I had been craving for a while. I used a tin of pie apples and added cinnamon and stevia. I made the crumble from oats, coconut, cinnamon, flaked almonds, walnuts, a little flour, stevia and a some melted butter. I ate it with greek yoghurt and pomegranates. Add some dark chocolate to the mix and you have my eats for the day. Hope you are feeling inspired with your meals! Oh my goodness, your lunch has me so jealous! Yum! !